“Collecting cards have not only been a hobby for me, but a passion. My earliest cards collected were rookies of Mario Lemieux, Steve Yzerman and Pat LaFontaine. The first Upper Deck cards I collected consisted of rookies like Jeremy Roenick, Alexander Mogilny and Jaromir Jagr – all of which I still have. “One of the most exciting aspects of being a parent is sharing your own hobbies with your children, and hoping they will share your passion. That is what I have begun this year with my two boys: Tanner and Jaxson. 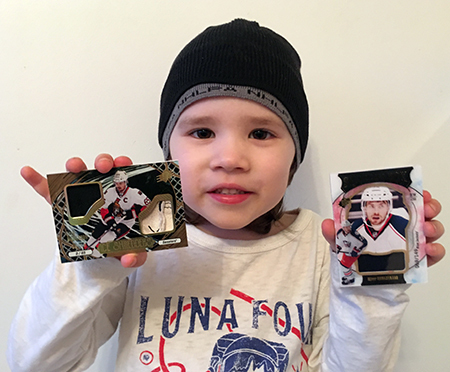 Together, we cracked open a few boxes of Upper Deck SPx and the new AHL cards from Upper Deck. To say it was gratifying and somewhat funny would be an understatement. “Tanner is at that stage where he is into everything including sports, TV and toys in no particular order. Tanner likes hockey and when I told him about opening up some hockey cards, he thought it was cool. The SPx proved to be a pretty cool set to pull from for us. Tanner pulled an Erik Karlsson Ice Shredders card limited to just 15 copies. He thought it was neat because part of Karlsson’s hockey gloves were inside of the card. Tanner’s other favourite pull was a Shadow Box Rookie of Oliver Bjorkstrand. His reason for liking the card was, “because it is bigger and better than the other cards.” These Shadowbox cards are very thick! “I have really become a fan of the Upper Deck SPx and SP Authentic over the last couple of years. So, cracking open a couple boxes of SPx is always fun. I had some pretty good luck pulling some nice White Out autos (Matheson and Trouba), a nice Black Holo Shield Auto of Christian Dvorak. 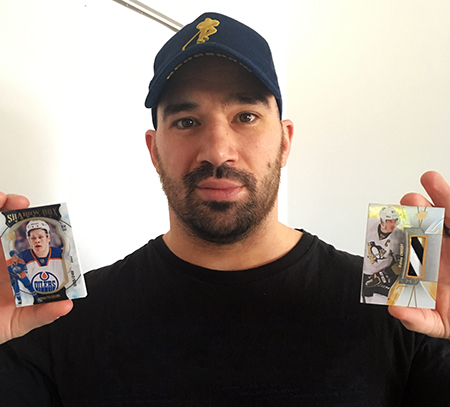 My two faves were the Sidney Crosby patch card limited to just 10 copies and a Jesse Puljujarvi Shadow Box rookie. Anything with Crosby is not only valuable, but pretty nice to look at. With Edmonton on the rise, the Puljarvi is a sweet card too! 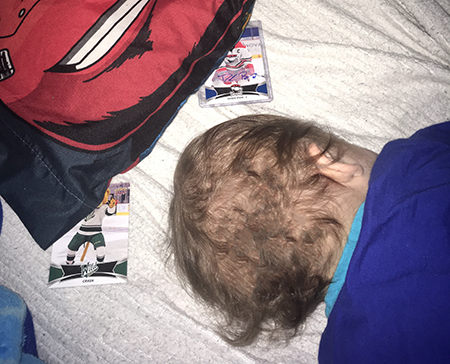 “My youngest, Jaxson, loves hockey. It’s a little problematic to be honest. Instead of only shooting balls and pucks, he wants to shoot cars, shoes and whatever else he can move with a hockey stick. Walls and shins are no match for him, as he can be a little destructive. Therefore, I thought it was best for him to open up the AHL cards. Kids LOVE the Upper Deck AHL Mascot cards! “Jaxson was a huge fan of the mascot cards. Whenever we pulled one, he would bring it over to the TV as if he was waiting for the mascot on one of his cartoons. 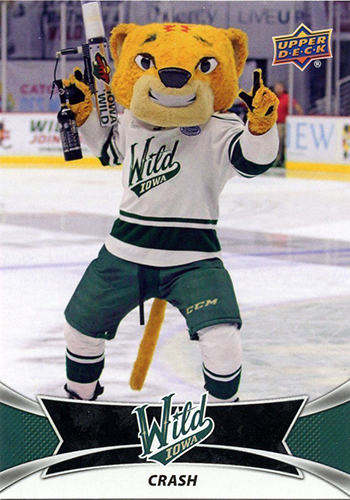 His favorite mascot was Crash from the Iowa Wild. Jax kept on saying he looked like Big Bird! When we pulled the Derek Ryan autograph, and I put the card into a top loader, Jax would not let it go. It’s as if he knew it was somewhat better than the mascot card because it was being protected. I actually allowed him to take the cards to bed with him. He’s been keeping them both under his pillow in his safe place. At Upper Deck we firmly believe that collecting cards can bring families together and create bonds that can last a lifetime. We’d like to hear your stories about sharing the hobby with your children whether you are a mom, dad, grandma, grandpa or teacher. 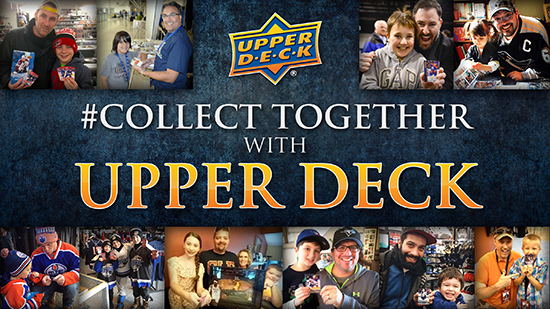 Email us at UpperDeckMarketing@upperdeck.com your story with images so we can share here on the blog and you could score an Upper Deck Random Acts of Kindness mail day!